May 1st is International Workers’ Day. I think it’s a good day not to work either as a way to mark the importance of the workers of the world, or as a symbolic protest at how the workers are being royally screwed. Either way it’s a day that amounts to more than maypoles, though they have their place. I have often contrived to down tools on 1st May even when I worked in the USA where vacation time could be a measly two weeks… after the first year. Up the workers. 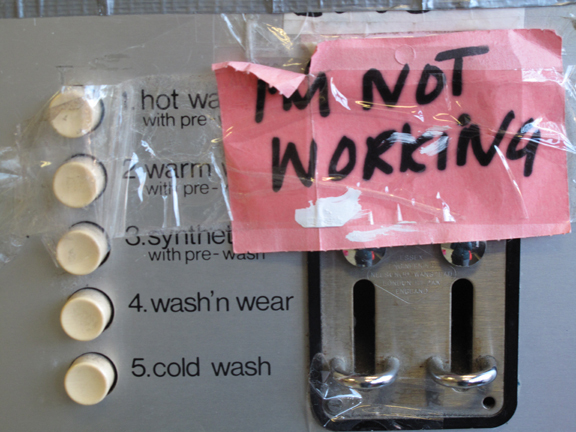 Photo taken in a local launderette. This is one tired (from over work) machine. This entry was posted in Peckham, Photography, Writing and tagged 1st May, launderettes, May 1st, Mayday, not working, workers of the world. Bookmark the permalink.